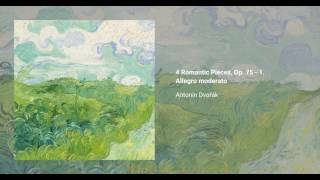 The Romantic Pieces by Antonín Dvořák are arrangements for violin and piano of some earlier works by the composer himself, originally written for a 2 violins + viola trio. The Romantic Pieces are catalogued as Op. 75, B. 150, and the original pieces are labeled Op. 75a, B. 149. They were written and published in 1887, though the original trio version did not see the light until 1945. 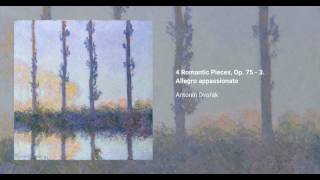 It appears, in fact, that even Dvořák forgot these pieces existed in that form, as stated in some of his letters. The Romantic Pieces are relatively simple from a technical perspective, but nonetheless passionate and expressive in nature.